KCKCC – Page 2 – Welcome to Wyandotte Daily! Looking for a job? Want to change careers? Then mark your calendars for Kansas City Kansas Community College’s 2019 “Get Hired-Kansas City” Career Expo. The expo is from 9 a.m. to 1 p.m. Thursday, April 25, at the Jack Reardon Convention Center, 520 Minnesota Ave. in Kansas City, Kansas. The event is free and open to the public with special services for veterans. Over the last several years, a high number of those who were interviewed at the career expo were hired on the spot. This year, more than 90 employers will be present. The Get Hired Kansas City Career Expo is a joint effort with U.S. Rep. Sharice Davids, KCKCC President Greg Mosier and Unified Government Mayor-CEO David Alvey. New this year is the location. The Career Expo is moving downtown to increase accessibility for all community members. Staff will be available to assist applicants with creating and printing resumes, completing online or paper applications and career assessments. • Emerald Healthcare, a subsidiary of Ensign Group Inc.
• Keller Fire & Safety, Inc.
• Kocher + Beck USA, L.P. The career expo’s resource partners include Workforce Partnership, KCK Housing Authority, Made Men, J.E. Dunn, Connections to Success, The Yellow Brick, Greenbush, Catholic Charities and NBC Community Development. For more information on the Get Hired Kansas City Career Expo, call 913-288-7880. Kansas City Kansas Community College returns to the torrid Jayhawk Conference softball race Thursday after sweeping a non-conference doubleheader 4-3 and 9-1 at Southwestern Iowa Tuesday. Locked in a four-way tie for second place, the Blue Devils square off against Labette in Parsons at 2 p.m. Thursday in the Blue Devils’ final road conference twin bill of the season. Johnson County (13-3) leads the conference with Highland, Hesston and Cowley sharing second with KCKCC, all at 11-5., with Labette another game back at 10-6. With nine wins in their last 10 games, the Blue Devils’ improved their overall record to 32-14 with the two wins at Southwestern. A clutch 2-run triple by Alexis Rymer in the fifth inning rallied the Blue Devils to their 4-3 win in the opener. Trailing 3-2, Devin Purcell was hit by a pitch and Kaylee Arnzen singled to set up Rymer’s game-winning three-base hit. KCKCC took an early 1-0 lead on singles by Arnzen and Alaina Howe and Britney Smith’s RBI ground ball in the second only to have Southwestern score three times in the bottom of the inning on a double, single and an error. The Blue Devils cut their deficit to 3-2 in the fourth. Rymer was hit by a pitch, moved up on a single by Jennica Messer and scored on Brittney Beck’s infield grounder. Mackenzie Pinkerton (14-7) got the win with four innings of two-hit relief. She walked five and struck out seven. Shay Grosstephan worked the first three innings, allowing three hits and three runs, one of which was unearned. She walked five, fanned two. Faith Maslak (7-2) scattered five hits in the 5-inning 9-1 nightcap win, striking out two and walking one. Alaina Howe and Britney Smith both drove in three runs and Kaylee Arnzen two, each with a pair of hits as the Blue Devils did all their scoring in two innings. The big inning was the first when the Blue Devils scored six times on six hits. Arnzen and Smith each drove in two runs in the inning. After an error, Devin Purcell and Grosstephen singled and Arnzen delivered a two-run double. A walk, singles by Jennica Mieser and Howe made it 4-0 and Smith plated the final two. The other three runs came in the fifth highlighted by Howe’s 2-run double. 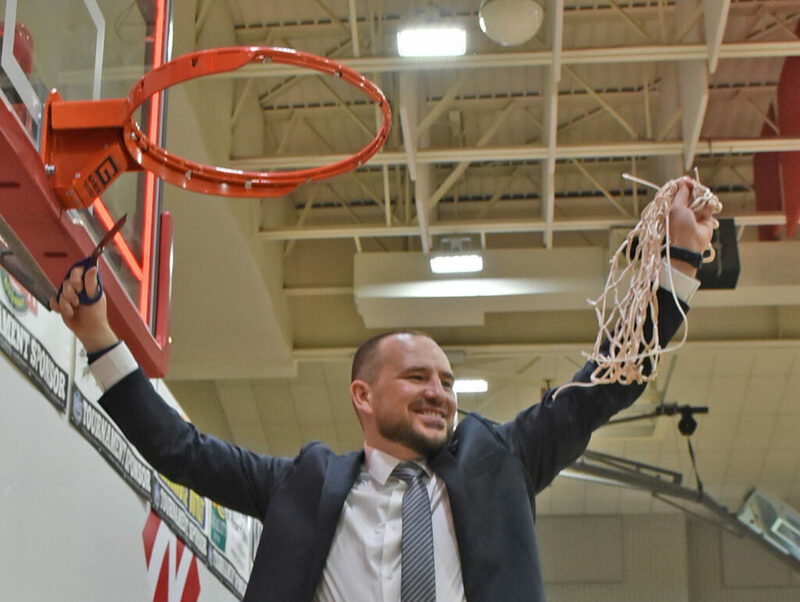 Joe McKinstry is the NJCAA DII National Coach of the Year for the second time in four years but the ultimate in accolades came recently at the NCAA Women’s Final Four in Tampa. 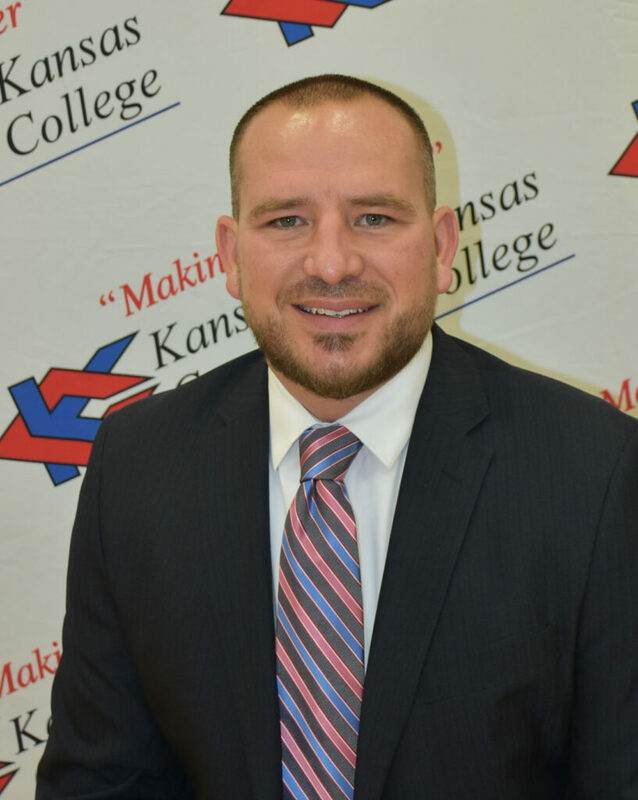 “I had a number of four-year coaches who were at our national tournament in Arkansas come up and tell me how well our kids played, how they shared the basketball and their ability to execute offensively,” said the fourth year Kansas City Kansas Community College head coach. The NJCAA coaching award is McKinstry’s third this year. Voted Jayhawk Conference Coach of the Year, he also won the national tournament coaching award. “On a personal level, it’s kind of surreal,” McKinstry said of the NJCAA Award. “It’s not something I think about but don’t get me wrong, I’m going to keep it. It’s certainly something I take pride in but honestly, I’m a much better coach than when I won the award in 2016. But I also thought I was a better coach in 2017 and 2018. Those teams just didn’t win national championships. McKinstry got his 100th win this year and now has 105 wins in 136 game in his four years at KCKCC. The Blue Devils finished 32-4, the third most wins in history. They also won the Jayhawk Conference Division II championship for the first time and led every national tournament game by at least 20 points culminated by an 84-59 cruise in the championship game. The national championship enhanced further the strength of the Jayhawk Conference which has put teams in the Final Four each of the last six years (three titles, two seconds and a third). “We’ve played eight games in the national tournament and were well-conditioned and prepared for that level of basketball which speaks to the other teams in our conference and the talent and competitiveness coming out of Region VI,” McKinstry said.